A TYPICAL SCENE on a Chinese railway platform showing the open box-cars in which farmers and others often travel without protection from the sun or rain. It was a long while before railway pioneers in China could persuade the people to consent to the construction of the railway. An early line, regarded as an ill omen, was ruthlessly destroyed. IN Great Britain, the majority of the people wanted railways as soon as they became available. In China the great mass of the population formerly objected to any form of locomotion other than that afforded by the wheel-barrow, the horse, and the native boat. Most of the Western countries, however, acquired concessions, by one means or another, to build and operate railways in China. This vast country is now reasonably well served by lines that have been laid down by foreign engineers, and by the Chinese themselves. An early railway in China is that linking Canton to Kowloon, adjoining the British island of Hong Kong. Canton is one of the most populous cities in Southern China, and hundreds of thousands of its inhabitants live in native boats or sampans that cover the river - the largest floating population in the world. The British-operated section of the line is the section of twenty-two miles from Kowloon to Shum Chun. The remaining eighty-nine miles to Canton are under Chinese management. A concession was obtained to construct the line in 1898. and in 1906 the British section was begun. The standard gauge line is laid through difficult country, and great difficulty was experienced in securing native labour and making provision against floods. Native customs and superstitions also militated against railway building. Ancestral graves, of which there are myriads scattered indiscriminately all over the countryside, could not be moved. The railway had to deviate to avoid them. For the same reason the hills could not be blasted just where required to make a way for the track. More than a mile of tunnelling had to be resorted to, and this was accomplished by Italian engineers. About one-third of the country through which the railway passes is mountainous; the remainder is traversed by numerous rivers. These streams are flanked by rice-growing lands protected from floods by 10 ft “bunds” or banks. The “bunds” added to the difficulties of the engineers in building the bridges, of which there are seven in a distance of nine miles. Heavy embankments were consequently necessary over long stretches of line, and in flood time the railway is often all that appears above the waters for many miles. The line was first opened for through traffic on August 5, 1911. The Canton-Kowloon Railway is well equipped with modern passenger coaches and steel-sided wagons, mostly of British manufacture. O ne of the most important links in the whole of China’s railway systems is the Canton-Hankow line. ON THE KOWLOON-CANTON RAILWAY. A sixty-five tons breakdown crane built for the British section of the Kowloon-Canton Railway, opened in 1911. The beginning of this railway may be traced to the year 1896, when the scheme was first proposed. By 1904 an American syndicate had built a branch line from Canton westward to Samshui, a distance of thirty miles. International complications then arose, which stopped further progress until 1905. In that year local promoters raised sufficient capital to redeem the American concession. Construction of the line was then taken over by the Canton-Hankow Railway Company, and by 1915 the rails had been laid between Canton and Shiuchow, 138 miles distant. The war of 1914-18 created such financial difficulty, however, that construction was stopped. 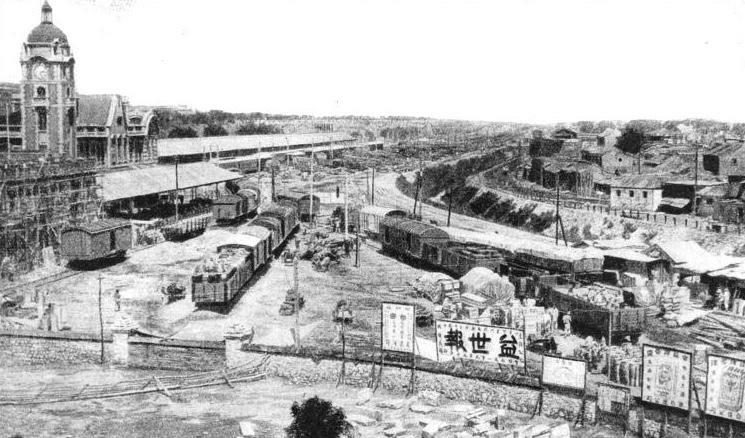 The northern section of the railway with its terminus at Wuchang, opposite Hankow, on the River Yangtze Kiang, was put into the hands of British constructors under an agreement of 1911. This contract, known as the Hukwang Railway Loan Agreement, provided for the building of a line from Wuchang to the southern boundary of Hunan, connecting with the southern section of the line. Work was begun at the Wuchang end in 1912, but, with the outbreak of the war, it was only possible to open the line as far as Changsha, a distance of 228 miles, in 1917. An extension of this line from Changsha to Chuchow due south for a distance of thirty miles was completed at the same time for the transport of coal. With the completion of the two end sections of the railway, the southern of 138 miles and the northern for a distance of 258 miles, a gap was left of 283 miles. This gap was destined to stay incomplete for a period of thirteen years, as it was found impossible to undertake the construction of a line through such extremely difficult country without adequate resources or the security afforded by settled government. In 1929, however, the Chinese Ministry of Railways decided to resume work on the section from Shiuchow to Lochang for a distance of thirty-one miles. The route of this section follows the upper course of the North River, and involves the crossing of the Nan Hsiung River by means of a steel bridge. In this section also is a tunnel 466 yards in length, one of the longest in the entire system. The Shiuchow-Lochang section was completed in September 1933, and handed over to the southern section of the Canton-Hankow Railway for operation. In July 1933 work on the railway between Lochang and Chuchow was pushed forward vigorously, and the final link between northern and southern China is scheduled to be completed in 1936. Another of the important lines in China is the Nanking-Shanghai Railway, which serves the Yangtze Valley. This railway was built by British engineers, and is 193 miles long. A branch line from Shanghai, on the Wangpo River, links the town with Woosung at the junction of the Wangpo with the Yangtze. The building of this branch line, its destruction, and revival provide an interesting story. A 4-6-0 PASSENGER LOCOMOTIVE operating on the British section of the Kowloon-Canton Railway which runs from Kowloon, near Hong Kong, to Shum Chun, a distance of twenty-two miles. A concession to construct this important line was acquired in 1898. In 1865 it was proposed that this line should be built ostensibly as an object lesson to the Chinese in the construction and running of railways. The scheme was strenuously opposed, and had to be abandoned. Local interests, however, demanded a railway, and to overcome Celestial objections, a British company, Jardine Matteson & Co., obtained a concession from the Chinese Government to build a “road” along the proposed route. Land purchase for the scheme used up most of the Woosung Road Company’s capital, but in 1875 it was decided that a narrow-gauge (2 ft 6-in) railway should be laid on the “road”, to be worked by small engines. At the beginning of construction, early in 1876, the Chinese Government protested that only a road had been sanctioned - not a railway. The construction gang’s engine was accordingly stopped, but the laying of the line continued. The native workmen used hand trollies to take material to the railhead. Each trolley bore a red flag, and red flags were carried by coolies both before and behind the trolley, to ensure the highest possible factor of safety. The Chinese opposition to the use of the steam engine was withdrawn (and re-imposed) several times, but the line was finished as far as Kangwan, five miles from Shanghai, and officially opened on June 30, 1876. The remainder of the line was being laid when a Chinese was knocked down by the engine and killed. Riots ensued, and the line had to be closed. The Chinese Government, however, agreed to purchase the railway, which was reopened in December, 1876. When the final payment was made by the Chinese in October, 1877, all traffic was stopped. Shortly afterwards the rails were torn up and were shipped with the engines and carriages to the Island of Formosa, where they were dumped into the sea. A temple to the Queen of Heaven was erected on the site of the Shanghai Station. The line was rebuilt by the Chinese in 1898, and later became part of Nanking-Shanghai Railway. Woosung, scene of China’s first railway, now has extensive workshops and yards for the maintenance of its modern locomotives and rolling stock. The construction of the main Nanking-Shanghai Railway was agreed upon between the Chinese Government and the British and Chinese Corporation, Ltd, in 1903, and the survey for a standard gauge (4 ft 8½-in) line was completed in 1904. T he first section of the railway, from Shanghai to Nanziang, was opened in November, 1905, followed at intervals by the lines to Wusih, Changchow, Chinkiang, and finally to Nanking in March, 1908. Though most of the country between Shanghai and Nanking is flat, some 300 bridges and 400 culverts were built during the construction of the railway. Most of the bridges are of concrete, but about 2,000 tons of steel bridgework was erected, all of which came from England. THE CHINESE NATIONAL RAILWAYS operate some 4,280 miles of standard gauge track, and 150 miles of metre-gauge track. The first line in China was completed in 1883. Many new railways are under construction or projected in China to-day. The whole of the land in the railway zone is closely cultivated, hut probably one-tenth of the area is given up to ancestral tombs, which undoubtedly are the cause of many unexpected deviations in the lay-out of the track, since these graves may not in any circumstance be moved or interfered with in any way. The railway is to-day well equipped with modern rolling stock, locomotives, and buildings. It has a mileage of 203. A remarkable offshoot of the Nanking-Shanghai railway is the Nanking City line, completed in 1908. This line, about eight miles long, is of standard gauge, but was originally introduced as a feeder line from the outlying districts of Nanking to the terminus of the railway from Shanghai, just outside the city. The city of Nanking, now the capital of the Chinese Republic, covers over fifteen square miles enclosed within enormous walls. The Nanking-Shanghai Railway is linked with the Tientsin-Pukow line by train ferry at Nanking. Linking the Yangtze Valley with northern China are two main lines, one (the older line) from Hankow to Peking, now renamed Peiping, the other from Pukow to Tientsin. The Tientsin-Pukow Railway is joined to Peking by the Peking-Mukden Railway, which passes through Tientsin. The Peking-Mukden Railway joins the South Manchurian Railway at Mukden, now known as Shenyang. Before the opening of the Tientsin-Pukow Railway, passengers from Shanghai to Peking changed from the train to a river steamer at Nanking, joining the Hankow-Peking lines train at Hankow. Travellers now cross the River Yangtze from Nanking to Pukow and take a through train of the Tientsin-Pukow Railway to Tientsin. The Tientsin-Pukow Railway was a joint British-German concern. That part of the line built by British engineers extends from Pukow northwards for a distance of 236½ miles to the Grand Canal of China. The remaining 394½ miles to Tientsin is German-built. The British section was begun in 1908 and opened for traffic in 1912. This may be accounted excellent progress, as the period covers the Chinese Revolution, and the line was in the battle area. Apart from this, the difficulties attending construction were considerable. In the first hundred miles from Pukow there are several long cuttings in the solid rock, and the maximum permissible gradient of 1 in 100 had to be resorted to for about forty miles. Swamp ground necessitated the provision of high embankments, and on one stretch of flood land, five miles in length, the top of the embankment is 20 ft above ground level. After the first hundred miles the country is practically flat, but some cuttings were needed to avoid detours in certain instances. The gauge is 4 ft 8½-in, and the line is heavily ballasted throughout with limestone obtained from the neighbouring hills. IN THE NORTH of China the line from the town of Kalgan runs for some miles parallel with the Great Wall. This photograph illustrates a halt at Chung-Lung-Tsau, on the famous wall itself, showing a goods train hauled by a Mallet articulated locomotive. There are several bridges, the longest being that across the Hwai River, with nine spans of 200 ft. Another bridge, at Ise Ho, has five spans of 200 ft and three of 50 ft. There are extensive railway workshops situated within the city of Pukow. The old city wall boundary encloses the buildings on two sides. The northern end of the Tientsin-Pukow Railway was built by German engineers, and at Tsinan passes through the western terminus of the Kiaotsi Railway - also built by the Germans. Construction work on the German section was begun on July 1, 1908, and the first through train service ran on December 1, 1912, although some portions of the line were opened for traffic in November, 1910. In particular the line from Tientsin to Tsinan was opened before the end of 1910, and did a good traffic with the east coast via the Kiaotsi Railway. At the same time a junction was made with the Peking-Mukden line, opening up trade with North China. The materials used on the German section naturally came from Germany. The engineers’ method of providing ballast for the track is interesting. The line runs through a great plain devoid of hard stone, but abounding in alluvial deposits and loess. A number of kilns were built along the route, and in these the available material was burnt to a clinker, and finally broken up into ballast. Only the lower bricks in the kilns were hard enough to form ballast, but the remainder were used to build the station houses and platforms. FIRST-CLASS ALL-STEEL DINING CARRIAGE used on the British section of the Kowloon-Canton Railway. 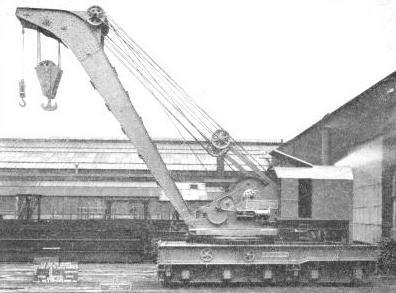 The length of this modern vehicle over the buffers is 63 ft 1½-in; tare weight is 38 tons 14 cwt. The dining car was built and designed by the Leeds Forge Co, Ltd, of Leeds, Yorkshire. The kilns were used also for the making of tiles, moulded to artistic shapes, which lent a pleasing and typically Chinese aspect to the railway buildings. There are no tunnels on the Pukow-Tientsin Railway, but, in common with the southern section of the line, the building of the northern section necessitated a number of bridges, some of them over 500 ft long. The longest bridge is that over the Yellow River, and this is said to be the largest stone pier bridge in China. This bridge is 1,360 yards long, and is built on the cantilever principle, with a central span of 507 ft, flanked by two anchor-arm spans of 300 ft each. In addition, there are nine truss spans each 300 ft in length. As no solid rock foundations were available, the stone piers were built on huge wooden piles driven deep into the bed of the river. The Yellow River bridge is an imposing structure, and can be seen rising from the plain from a distance of many miles. In 1897 two German missionaries were murdered by Chinese in Shantung. A German squadron thereupon took possession of Kiaochow Bay and the surrounding country. After the settlement of this incident with the Chinese Government, a concession was granted to Germany to build two railways in Shantung, and mining rights were acquired. A line was built from the port of Tsing-Tao to Tsinan, where the Kiaotsi Railway now meets the Tientsin-Pukow line. 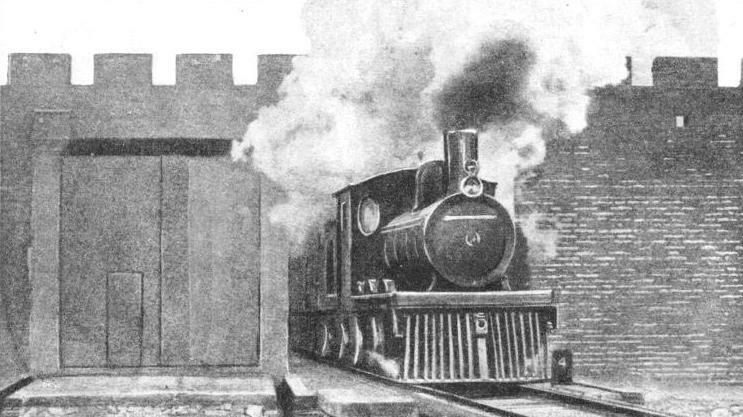 The gauge is 4 ft 8½-in, and construction was carried out with steel sleepers. The route runs through level country, and there are no cuttings or tunnels. There was, however, the usual difficulty with water, and no fewer than 1,300 culverts and bridges were constructed during the building of the railway. There are repair shops at Tsing-Tao. When these were first built, a technical school was inaugurated to teach the local Chinese employees not only the rudiments of railway working, but also the reading and writing of their own language, together with the elements of arithmetic and German. “PACIFIC” TYPE LOCOMOTIVE built for the Tientsin-Pukow Railway. The leading dimensions of this British-built engine are: cylinders 20-in by 28-in, diameter of coupled wheels 5 ft 9-in, boiler pressure 200 lb per sq in, tractive effort 24,350 lb, and total heating surface, including superheater, 2,390 sq ft. The total weight of engine and tender is 147 tons 18 cwt. We have seen how many of China’s railways sprang from concessions granted for one reason or another to foreign powers. One line in China, however, grew with the necessity of transporting coal from the Kaiping coalfields. These mines were first developed in 1878, and although the coalfields extend to the sea, an ice-bound coast in the winter months rendered it necessary to have another outlet for the coal. In addition, the supplying of coal to the interior of China had to be considered. 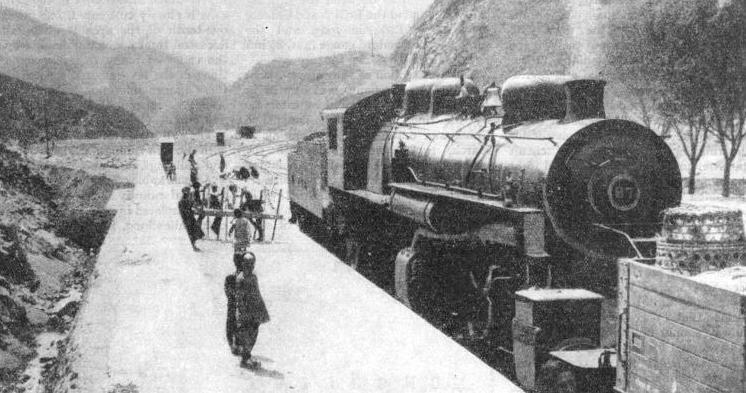 All efforts to persuade the Chinese to sanction a railway had failed, but a canal was constructed from the Pehtang River to a point seven miles from the colliery. Finally the Chinese authorities consented to the construction of a line, to be called the Kaiping Tramway, and operated by mules. The engineer of the Chinese Engineering and Mining Company, Mr. C. W. Kinder, decided to build this “tramway” to standard gauge. On completion of the track Mr. Kinder began to build a locomotive at Tongshan, using materials from the colliery scrap-heap. The engine frame was built up of channel iron from old pit head-gear, the cylinders from an old steam engine, and the boiler from a portable engine lying disused at the mine. The locomotive cost about £75. The reason for building the locomotive was that if the engineer had attempted to import one into China there would have been riots, and his “tramway” would have shared the fate of the Woosung “road” referred to earlier in this chapter. Work on the engine was suspended several times, and it is said that on one occasion the incomplete machine was buried in the ground so that Chinese officials should remain unaware of its presence. In June, 1881, however, the little locomotive started work on the tramway, which was extended about five years later along the side of the canal, to Lutai, where it now forms part of the main line. In August, 1888, the railway reached Tientsin, and extensions were made to the Great Wall of China at Shanhaikwan and to Tungchow, twelve miles from Peking. The main line, including a fifty-seven miles branch to Neuchwang, is just over 600 miles long, with some 150 additional miles of sidings. Bridges are numerous; about 160 ft in every mile of the line there is bridge-work. Many of the bridges have over twenty spans of 100 ft each. The largest bridge is that over the River Lan Ho, and has ten spans of 100 ft, five of 200 ft, and two of 30 ft. This was the first large bridge to be built in China, and proved to be a difficult task. The Lan Ho in flood is most destructive, dashing trees and other debris against everything in its path. To ensure safety the masonry piers of the bridge are therefore carried down to bed-rock, 70 ft below the surface of the water. The railway was finished after the Russo-Japanese War of 1904-5, when the Japanese military railway between Hsinmintun and Mukden was bought by the Chinese, and rebuilt to standard gauge. This gave through communication between Peking and Europe via the Trans-Siberian Railway. There are certain branch lines north of Peking, one of the most important being the Peking-Kalgan Railway, which starts from Fengtai, on the Peking-Mukden line, and runs to Kalgan, a distance of 125 miles. There is also a branch line of sixteen miles from Hsichihman, near Peking, to Mentonkon, whence anthracite is transported to Peking, and its neighbourhood. From Kalgan the line runs west through Suiyuan to Paotow. 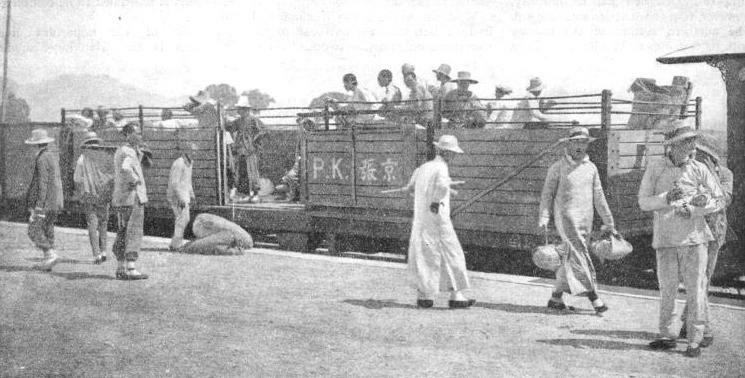 ON THE PEKING-HANKOW RAILWAY, a goods train at Pao-Ting-Fou. The Peking-Hankow Railway has about 820 miles of standard gauge track open, and there are some 200 locomotives and 2,060 carriages and wagons in operation on its lines. From Nankow, thirty-four miles from Fengtai, tourists on the railway set out on ponies for the famous Ming tombs in the mountains. The Peking-Kalgan Railway climbs the mighty Nankow Pass, the gateway to Mongolia. The Great Wall of China is built along the mountain tops across the pass, which is shared by the old Imperial North Road, a mountain torrent, and the railway. The line has to climb 1,641 ft in a distance of under twelve miles. This has entailed a gradient of 1 in 40, with occasional stretches of 1 in 30. Even with this steep gradient it was also necessary to construct four tunnels, with a total length of 5,397 ft, and a “reverse” or zig-zag. Apart from the tunnelling, the railway embankment had to be protected by stone facing and walls from the action of the river when in flood. Once through the pass, the engineers encountered no further difficulties in building the remainder of the line to Kalgan. In contrast with other railways in China this line does not pass through flood lands, and stone for ballasting and other purposes is plentiful. Little bridge construction was needed, and the largest bridge is one with a single 100 ft span. An agreement for the building of the South Manchurian Railway was entered into by Russia and China in September, 1896. From its inception the political forces behind the move were of far greater importance than considerations of transport. The line, built by Russian engineers with Russian capital, was transferred to Japan by the Treaty of Portsmouth in 1905. The South Manchurian Railway runs from Darien on the Yellow Sea (with a branch to Port Arthur), through Mukden (Shenyang) to Hsinking (formerly Changchun) in Manchukuo, formerly Manchuria. Mukden is the northern terminus of the Chinese Government railways, and Hsinking is at the southern end of the Chinese Eastern Railway, also built by the Russians. The Chinese Eastern Railway was built to a gauge of 5 ft, and really forms an extension of the Trans-Siberian Railway. The South Manchurian line was completed in 1901. Early in the progress of the Russo-Japanese War the railway fell into the hands of the Japanese, but the Russians had removed the rolling stock to the north. The Japanese made immediate use of the track by altering the gauge to that of their own lines, 3 ft 6-in, and locomotives and rolling stock were shipped across from Japan. At the same time the Japanese built a light 2 ft 6-in gauge railway from Antung, at the mouth of the River Yalu, to Mukden. After the transfer of the South Manchurian Railway to Japan, a company, under the control of the Japanese Government, was formed, not only to take over the administration of the railway, but also to administer South Manchuria on behalf of Japan. This was in 1906, and provides an interesting sidelight on the formation, in 1934, of the state of Manchukuo. The first task of the new company was to widen the line from Dairen to Changchun - as it was then called - to the standard gauge of 4 ft 8½-in. This was completed on June 1, 1908, and the 3 ft 6-in gauge stock re-shipped to Japan. In 1909 the Japanese began the rebuilding of the narrow-gauge military railway from Mukden to Antung, a difficult task, as the route lies through mountainous country. The maximum gradient is 1 in 80, and there are many sharp curves. In addition, as many as twenty-four tunnels had to be constructed, the longest being 4,884 ft. A number of bridges also had to be built, and the longest at Pen-Chi-Hu has ten spans of 60 ft and ten of 105 ft. The total length of the Antung branch is 162 miles, and it was opened for traffic on November 1, 1911. The rebuilding of this branch completed the conversion of the South Manchurian Railway to standard gauge, but, because of a curious oversight, through running to Chinese lines at Mukden was not possible. 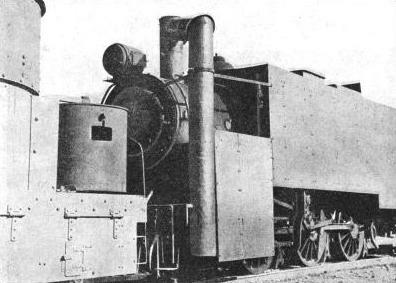 South Manchurian rolling stock was 8½-in lower at the buffers than that of the Chinese railways. Construction of the main line from Changchun to Dairen did not present quite so difficult a task as work subsequently carried out on the railway, as the country presents few natural obstacles, and permits a maximum gradient of 1 in 100. THE EVIDENCE OF TWO CIVILIZATIONS can be seen in this remarkable picture of the old city wall at Peking with the railway track laid alongside it. Peking is the meeting-place of some important lines. Dairen is laid out on modern lines and has a regular steamer service to Shanghai. The railway workshops at Dairen are fully equipped for constructing and repairing locomotives and rolling stock. In addition to the railway linking Nanking and Peking, there is an older route between the Yangtze River and the former capital of China. This is known as the Peking-Hankow Railway. Hankow, which lies on the Yangtze, was the proposed starting-point of a railway, suggested in 1863 by Sir MacDonald Stephenson, that was to run eastward to Shanghai and westward to India. The route outlined by this great engineer for reaching Peking coincides with that of the present Tientsin-Pukow Railway. 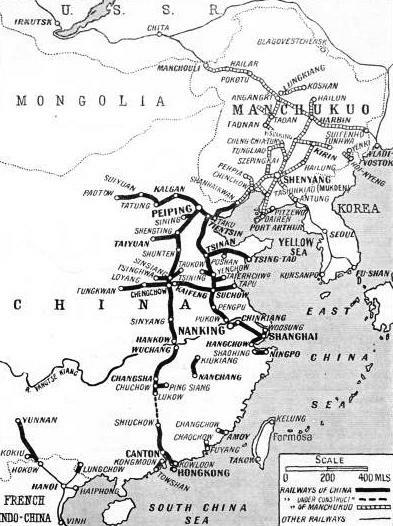 Definite proposals to link Hankow and Peking by rail were put forward in 1895, and a survey of the route was begun the following year by an American syndicate. The survey was completed in March, 1897, but neither the Americans nor the British were successful in the final negotiations with the Chinese authorities, since the concession to build the railway went to the Belgians. A protest was lodged by British merchants with interests in the locality, and concessions were obtained for lines radiating from Shanghai, for the Canton-Kowloon line, and for other lines projected in Honan and Shansi. The work of the Belgian engineers began in 1900. 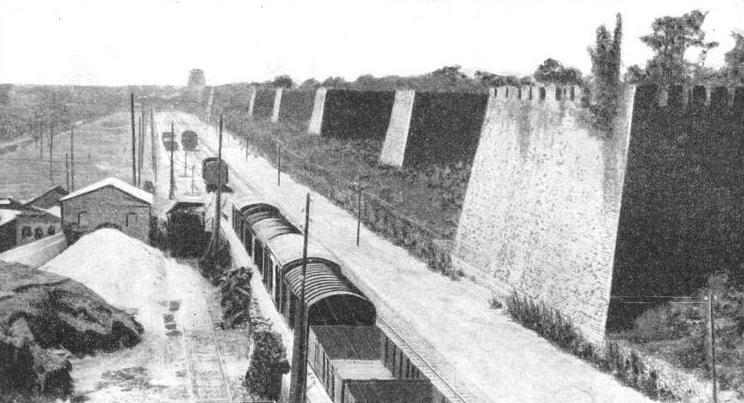 A section of line, from Lukouchiao to Paoting, had already been built about 1896 by Britain. This line, about eighty miles in length, was taken over by the Belgians. During the international military occupation necessitated by the Boxer Rebellion of 1900, French engineers carried the line from Lukouchiao to Chien-men, one of the gates of Peking. The distance from Paoting to Hankow - the Belgian section - is 663 miles, and the mileage of the Peking-Hankow Railway, including branch lines, the eleven miles constructed by the French military engineers, and the eighty miles of British line, reaches a total length of 817 miles of standard gauge track. There are few cuttings on the route and the lines are laid on the ground, following its contour, so that the rails can be seen for miles, glistening in the sun and undulating with the countryside. It was necessary to construct two tunnels on the Peking-Hankow Railway, one 371 yards long, the other of 351 yards, on the south side of the Yellow River. There are no fewer than 1,285 stone bridges and culverts and 875 iron bridges. The most important and interesting bridge, and by far the largest, is that over the Hwang-Ho or Yellow River. The Yellow River is known justifiably as “China’s Sorrow”, and changes its course at irregular intervals, generally with enormous loss of life. The changes are so complete that the old beds of the river can be seen several hundreds of miles apart. This erratic behaviour is due to the fact that the river flows on an elevated part of the country with a sandy soil, and has no rock or clay in the formation of its banks for hundreds of miles. The railway does not descend into the river “valley” but rises to meet it. Building a bridge across such a river proved no light undertaking, especially as the bed is of shifting sand, with two deep “scours” or channels where the current is very strong. These “scours” will sometimes be increased in depth by floods to the extent of some ten or twelve feet. The Belgian engineers decided to construct their bridge on “screw” piles, so that in the event of a change in the river’s course at the site chosen, it would be possible to re-erect it elsewhere. The cast iron “screw” piles are 12-in diameter, about 50 ft long, and are sunk into the river bed to a depth of about 30 ft. There are 102 spans, carried on girder-piers resting on the piles, and the total length of the bridge is 1 mile 1,531 yards. The Yellow River Bridge cost £520,000, and was opened for traffic in November, 1905. A LINE THROUGH A CITY WALL. A Hankow train passing through an ancient rampart at Peking. The building of a through line between the two cities was chiefly the work of British, Belgian, and French engineers. One section of the line was completed as far back as 1896. The Peking-Hankow Railway was taken over by the Chinese Government on January 1, 1908. Railway workshops are situated about twenty miles from Peking, on the main line, and these are fully equipped for all classes of repair work on locomotives and rolling stock. The locomotives used include some powerful “Mallet” engines, for working the steep gradients - in some places as steep as 1 in 66. Three-quarters of the whole line are on gradients, and there are numerous heavy cuttings through the solid rock. There are nineteen tunnels, with a total length of 2,350 yards, and eighty-seven steel bridges, together with a large number of stone bridges and culverts. The railway has its own self-contained workshops and power house. An interesting feature of the rolling stock is the provision, in a number of wagons, of adjustable axles, so that they can be used on adjoining standard gauge track. Traffic on the Cheng-Tai Railway, apart from passengers, is mainly coal, grain, and cotton. The total length of the line is 151 miles. Another line in the province of Honan is that running west from Tsinghwa to Taokow, and this may be regarded as an offshoot of the Peking-Hankow Railway. A concession to build the line was granted to the Peking Syndicate in 1900, to link the mines of that concern with the Peking-Hankow Railway. The Boxer rebellion delayed construction until 1902, when work on the railway was begun. The line was finished in 1905, and handed over to Chinese Government control. As was usual when foreign-built railways were taken over by the Chinese, payment was made by the issue of interest-bearing bonds. The line, completed in 1905, is ninety-six miles long, and crosses the Peking-Hankow line by a viaduct at Hsin-Hsiang-Hsien, where a graded branch line links up the two railways. The route lies in somewhat flat country and, although a number of bridges were necessary, none of these is of large dimensions. There are some fine repair shops attached to the railway, which is joined to the mining property of the Peking syndicate by a branch line 1,000 yards long. Another railway that crosses the Peking-Hankow line, at Chengchow in this instance, is the Lunghai Railway. This railway was built by Franco-Belgian interests, and the line was begun in July, 1905. The last section of the railway was completed to a length of 115 miles and opened for traffic in December, 1908. The track is standard gauge, and although the country between the terminus and Chengchow presented little difficulty to the engineers, the western portion entailed difficult construction work in mountainous country. The geography of the line is similar to that of the Cheng-Tai Railway, with which it runs parallel. There are eleven tunnels varying in length from 54 yards to 546 yards, and 403 bridges of both steel and stone. One of the finest of the steel bridges is that over the Lo Ho, completed in 1910, and this structure has seven spans with a total length of 345 yards. AT PEKING, the former capital of China, a view of the recently built junction and goods sidings. To the left can be seen a half-completed new railway station in the course of construction. Some big railway workshops are situated in the vicinity of the city. French Indo-China owes its political existence to a treaty signed by the Governments of France and China on June 9, 1885. This great tract of land, covering an area of nearly 300,000 square miles, is bounded on the north by China proper, and on the east and south by the South China Sea. Indo-China forms a gateway to Central China, with its vast possibilities of trade. The French lost little time in constructing a railway from the port of Haiphong as far as Laokay on the northern frontier, bordering on the fertile Chinese province of Yunnan. This section of the railway is 240 miles long. Unfortunately, however, Yunnan comprises some country presenting great difficulty to the railway engineer. Great mountain ranges, towering 4,000 to 7,000 ft, are intersected by deep, precipitous ravines in which flow swift rivers. To overcome this great natural barrier, the French Government obtained a concession to build a railway from the frontier to Yunnan-fu, the capital of the province of Yunnan, a distance of 290 miles. The line is built to the metre gauge, and is laid on steel sleepers. Great trouble was experienced in construction, as the mountains through which the railway winds are composed of rock interspersed with layers of clay in some places. In the rainy season it was a common occurrence for great overhanging masses of rock to break away and smash the track. One of the most spectacular feats of engineering on the Yunnan Railway was the crossing of the gorge through which flows the Faux Nan-ti, a tributary of the Nan-ti River. The Faux Nan-ti is a small stream, but it runs through a canyon with walls rising almost vertically to a height of 1,200 ft. The building of the line necessitated the bridging of this chasm, a distance of 215 ft between the opposite cliff faces at a height of 335 ft above the stream. To gain access to the cliff faces, tunnels were driven through the rock on both sides of the gorge. The steel bridge linking the tunnel mouths is of remarkable design and construction. Two triangular-shaped girders or bascules were erected, one on either side of the gorge. These were finally lowered so that their outer ends met in mid air forming a huge inverted V spanning the gap. The track was built on a deck supported on short steel towers erected on the upper sides of the bascules. The Yunnan line was completed in 1910 after some eight years of struggle against the forces of Nature, and in the face of labour troubles, coupled with financial and technical difficulties. Another line runs from Hanoi into the Yunnan province at Lungchow. Another important line in China is the Shanghai-Hangchow-Ningpo Railway, which was built by local companies and not under a loan agreement, as were many of the Chinese railways. To carry out the building of the railway, the Kiangsu Railway Company was formed in Kiangsu to construct the line as far as the Chekiang border. For the building of the line from this boundary to Hangchow and thence to Ningpo, another company known as the Chekiang Railway was incorporated. Construction was begun in 1906 and the line was opened for traffic to Hangchow in August 1909. By 1935 the line from Ningpo towards Hangchow had been completed as tar as Pokwan. The line had also been built out from Hangchow for a short distance in the direction of Pokwan. Part of the scheme for the final linking of the line from Shanghai through Hangchow to Ningpo is a great steel bridge across the Tsiantong Kiang River, the contract for which has been placed with a British firm. S ome of the enormous difficulties under which railway builders accomplished their great tasks have been outlined above, but the hidden obstacles against which railway construction was faced can be appreciated only by a knowledge of the country itself. ARMOURED TRAINS are sometimes used by the Chinese army. This picture shows a train near Ho-Nan. To the left can be observed a revolving machine-gun turret, while the locomotive is fitted with a smoke-absorbing device to prevent the train from being detected at a great distance. In 1918 the Chinese Ministry of Communications began to put in hand a system of unification among the various interests in the Chinese railway world. Between the years 1917 and 1922 a careful study was made of standardization. Large numbers of 40-tons wagons, both covered and open, were constructed which could go anywhere on the Chinese lines. After the war of 1914-1918 many lines were built with Chinese funds and labour, and by the end of 1931 the original Chinese National Railways had increased in route mileage from some 3,400 to over 6,200. The establishment of the State of Manchukuo resulted in a loss of Chinese track to the extent of over 1,500 miles. Of the principal lines now serving the country the Peking-Hankow Railway has 817 miles of track, and is equipped with over 200 locomotives and over 2,000 carriages and wagons. The Peking-Liaoning Railway has approximately 840 miles of track, with 262 locomotives and nearly 5,000 carriages and wagons. The Tientsin-Pukow Railway, with 685 miles of track, has 143 locomotives and over 2,000 carriages and wagons. The Kiao-Tsi Railway, with 280 miles of track, has rather heavy traffic, despite the shortness of its route. You can read more about “The Peking-Kalgan Railway” and “The Trans-Siberian Express” on this website. You can read more on the “Trans-Siberian Railway” in Wonders of World Engineering.